I'm back again with yet another I ♥ Makeup post. If you've read my blog a lot this month you'll know it's been full to the brim with plenty from the brand and Makeup Revolution, but I've got so many goodies that I want to share with you that they'll be plenty more coming your way. Since the brands have taken the beauty world by storm at late I'm sure you won't mind. 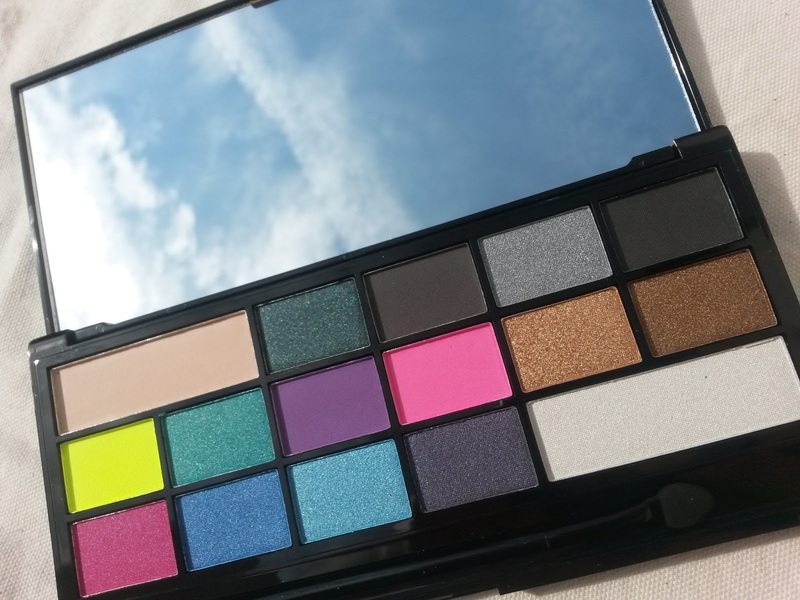 Today, I'm here with the I ♥ Heart Sin palette. 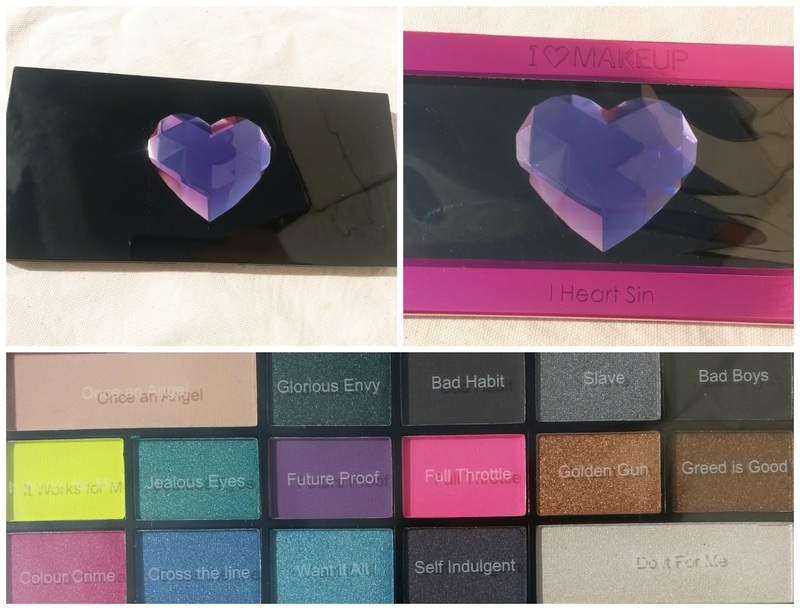 I ♥ Sin is a 16 shade eyeshadow palette full of mattes and shimmers. 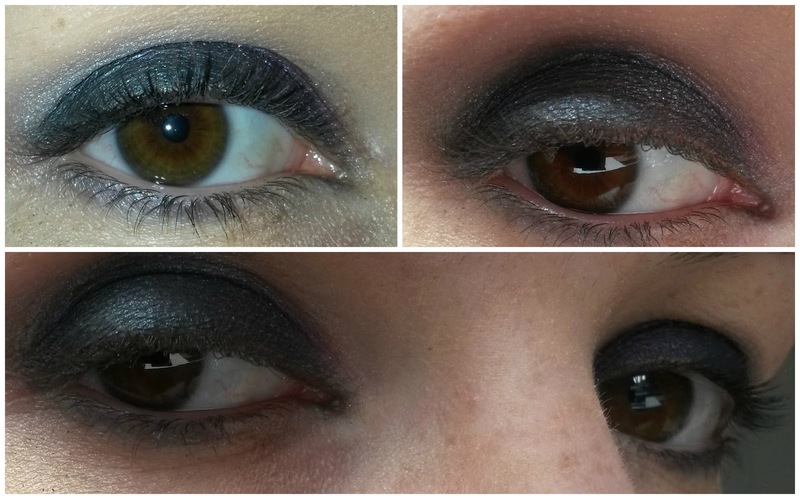 There's a whole lot of awesomeness going on in there with lots of bright shades and flattering dark's, for the ultimate smokey eye. Now, looking at this palette it's definitley something I wouldn't of gone for myself - I mean that bright yellow scares the living day light out of me - but this is actually a really pretty palette and I'm glad I got the chance to try it. This would definitely appeal to those with a creative side, but essentially this is a great night time palette. The pigmentation is absolutely incredible and for just £7.99 I can't recommend you picking this up enough. The shades are out of this world and so, so pretty. Shades go from top row down. They last so well but are prone to slight fall out, nothing major. The packaging is lovely with 3D purple heart. Inside is a good sized mirror and applicator. I wouldn't take this with me for traveling purposes as I'd prefer something that goes from day to night, and this definitely swings towards night wear/going out. Yes, slight fall out is visible and my eye brows need doing and I have clear mascara on. I used the applicator to create the look. This is a look I created using the palette, the lighting is so bad it doesn't pick up all the beautiful shades, however, it does give you an idea of just the sort of looks you can create using I ♥ Sin. I used Glorious Envy, Jealous Eyes, Colour Crime and Slave. You can purchase the palette here. If I've learned anything from getting my hands on this palette is to be more adventurous with shades that are available no matter how scary they may look. I have a giveaway open to the whole of Europe, please enter and be in with a chance of winning a beautiful charm bracelet of your choice from the selection available here. This looks like it has some lovely shades! wow look at those colours! so vibrant! Such a lovely palette. I want it. I definitely feel I need this palette. I love palettes where the individual shades have actual names ( a tad OCD, I know) but it is just what I prefer.